Born October 24, 1925, Al Feldstein was one of comics’ great guiding lights. Although an exceptional artist, Feldstein’s legacy comes from his work as a writer and editor at EC, where he was one of the primary driving forces behind two of the most influential movements in comics history. 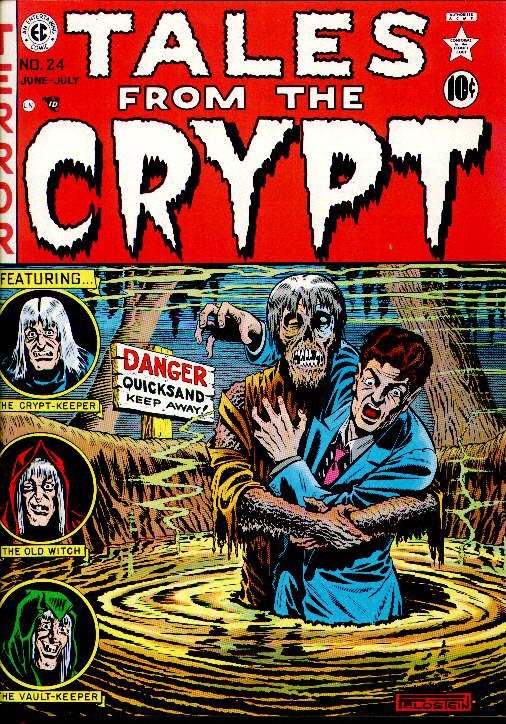 The roster of artists who played key roles in the success of EC Comics is downright legendary. Among their regular contributors are several masters of the form: Johnny Craig, Wally Wood, John Severin, Joe Orlando, Jack Kamen, Bernard Krigstein, Will Elder, Graham Ingels, Reed Crandall, George Evans, and Al Williamson. Even their infrequent freelancers include icons like Basil Wolverton, Frank Frazetta, and Alex Toth. By any measure, it’s one of the most impressive collections of talent in comics history, each of them uniquely gifted and imbued with a singular voice. Under the leadership of Bill Gaines, Harvey Kurtzman, and Al Feldstein, they created a new kind of comic that turned the industry upside-down. As an artist, writer, and editor, Feldstein had his hands in almost everything the company produced. Starting with EC in the pre-New Trend days, Feldstein was strictly an artist at first, where he quickly developed a good relationship with new publisher Bill Gaines, who took over after the unexpected death of father Max. Feldstein asked Gaines if he could write his own stories, and soon showed his aptitude for structure, pacing, and most importantly, an ability to work in a multitude of genres. Feldstein worked everywhere, from romance to Westerns, and soon Gaines began giving him script assignments for other artists. When Gaines launched EC’s New Trend line of comics in 1950, he chose Feldstein as editor, and the two worked closely together to produce content for up to seven titles. A voracious reader rendered sleepless by prescription diet pills, Gaines would consume short stories every night, then return to the office each morning with a fresh batch of ideas inspired by or directly lifted from whatever he’d read. Beginning with these “springboards,” Feldstein and Gaines hashed out a plot, then Feldstein went off to write the script directly onto the art board. Through this partnership, Feldstein churned out dozens of stories every month in nearly every genre the publisher covered at the time: grisly horror, weird, thought-provoking science fiction, gritty crime, and gut-twisting “shock” stories. He still created a few covers, but his duties as writer/editor made drawing comics impossible. And much to the delight of his artists, he never tried to foist his drawings onto them. Harvey Kurtzman, who edited EC’s two spectacular war comics and Mad, was nearly dictatorial on his titles. He not only researched and wrote nearly every story and tidbit for Frontline Combat, Two-Fisted Tales, and Mad, he provided each artist with detailed layouts that they were expected to strictly adhere to. Many chafed at working with Kurtzman. Feldstein was far more egalitarian. Recognizing the incomparable skills of the bullpen at EC, he never provided artists with layouts or breakdowns; just the story beats and the words. In this manner, Feldstein, Gaines, and the artists at EC revolutionized comics, as Feldstein developed his untrained voice at a remarkable rate. A master of the dramatic twist early on, his writing was always typified by clichés and tropes, but he quickly progressed to more substantive explorations of American culture and human identity. Stories that were nothing more than elaborate, twisted jokes sat next to poignant examinations of nuclear anxiety, racial inequality, and unrestrained portrayals of domestic violence. After the creation of the Comics Code Authority, EC Comics withered away to nothing within a couple of years. More restrictions meant less work for everybody, including Feldstein, who was once the most prolific contributor, and arguably reached his peak after the end of the New Trend. Gaines shifted focus to Kurtzman’s Mad magazine, pulling away from the comic book business entirely. But the door opened for Feldstein once again when Kurtzman demanded a majority share of ownership after Gaines offered him ten percent. Kurtzman left EC, taking a few Mad contributors with him. Gaines turned once again to his favorite collaborator. Feldstein had previously edited Panic, another parody book that attempted to capitalize on the success of Mad, so humor was yet another genre he was comfortable with. Feldstein took over as editor of Mad in 1956, and the landmark publication didn’t miss a beat. In fact, it was through Feldstein’s stewardship that Mad transcended from massive success to cultural phenomenon. Feldstein once again took a “less-is-more” approach. He hired talented artists and allowed them to be themselves, recruiting the likes of Don Martin, Mort Drucker, Antonio Prohias, and Sergio Aragones, over his first few years. Feldstein’s Mad was decidedly less cutting than Kurtzman’s, which could be absolutely vicious for the time. But like his predecessor, Feldstein saw through the façade presented by politics, media, and entertainment, and had no qualms parodying everything he could about American culture. Broader, zanier, and even more irreverent than before, Mad was the country’s most consistent satiric voice for decades. From the 1950s to the 1960s, readership of Mad under Feldstein doubled, and doubled again by its peak in the mid-1970s. Read by millions of adolescents every year, Mad left a permanent impression on one generation after another. There’s simply no understating the publication’s importance — or Feldstein’s — in the American humor tradition. Twenty-eight years after he joined Mad, Feldstein retired in 1984. He focused on a career in fine art in his final years, gathering significant acclaim as a wildlife painter. He passed in 2014, the last of EC’s guiding lights to go out. Next articleWhy Greenland is an island and Australia is a continent?